I don't claim to be a meterorologist, hence the (?) in this post. I enjoy observing the weather and sharing what I see. I was drawn to tonights clouds. There was a lot of texture with subtle shades of gray and blue which I enjoyed watching. 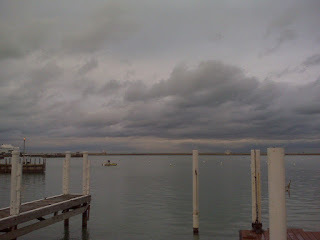 These seem to be typical spring clouds over the 40-something degree Lake Michigan waters. This view is looking east from the Chicago Yacht Club's Monroe Street Station docks. On the horizon to the left is the Columbia Yacht Club. About a third of the way from the left is the Chicago Harbor lighthouse. About a third of the way from the right on the horizon is the Odyssey dinner cruise ship. Click on the picture to zoom in.